Calls to end immigration are growing louder. This is the case in many countries. My home country, which used to pride itself on the words at the base of the Statue of Liberty, has citizens demanding an immense and impossibly expensive wall be erected to keep foreigners out. For two decades, I've lived in my adopted country. I love it as much as my home country, just in different ways, like you might love each sibling differently, but still to the bottom of your heart. Sometimes, when people talk about banning immigration, they tell me things like, But we don't mean you. You're different. I disagree. Now, years after arriving, I am established. When I first moved here, I entered the country as a tourist, but intending to stay (for love, but that's another story). I had no residence permit and no work permit. I had just enough money to get me through a couple of months. I had double-digit-thousands of dollars worth of student loan debt. I lived in my boyfriend's student dorm "illegally"*. The facility manager's apartment was two doors down from my boyfriend's room, so she knew what was going on. Lucky for me, she turned a blind eye. I'm married with two children. I have a residence permit and a work permit. My student loan debts are paid in full. I am a house owner. I am a Senior Project Manager at a well-known international company. Which means I am a taxpayer. What did I need to get to this point? A good education, funded to a high degree by parents who worked hard and long to provide it. The willingness to take a risk. Hard work and often long hours. Support from both loved ones and strangers. But also—and I know this is true—the "right" skin color and the "right" home country so that there was little to no prejudice. Not for my parents back home. Not for myself back home. Not for myself in my new country. So when you think something like, But we don't mean you. You're different, consider what you are really saying. I was poor, jobless and basically homeless. So, is the biggest difference really skin color? Interested in more on immigrants in the US in history? Check out this post. *living in the dorm "illegally" = dorms are for students only, no additional rent paid for an additional person. Once upon a time, I visited Noah Webster's house. Today, Merriam-Webster liked one of my tweets. First, I like the thought of the jigsaw pieces coming together to make something bigger and clearer than they were alone. Since I've never believed in the idea of "one true love," I also like that each piece has at least two to four others that would connect properly. Each individual piece is still the same, but then, the "big picture"—the couple's dynamic—would be a slightly different one. Taking this one step further...I know a lot of people don't enjoy love triangles in books (but if you do and you haven't read The Grisha Trilogy beginning with Shadow and Bone by Leigh Bardugo, you should, because love square!). A good love triangle just means there are two different puzzle pieces that fit, maybe on opposite sides. Each piece gives the main character something important, completes them in a different way. Each side offers an aspect the other side of the triangle is incapable of. So how do you explain those amazingly unlikely couples that somehow work? Well, this morning in the shower (best thinking place, right? ), I realized puzzle companies probably print their images on cardboard stock, then run a standard cutting die over them. Meaning many different puzzles most likely share the exact same cut lines. So you could have a King Tut burial mask puzzle with the same jigsaw shapes as a jelly bean mixture puzzle. King Tut's lower lip and the blueberry jelly bean might physically be a perfect match. Maybe the pictures don't make sense to everyone around them, but that doesn't mean they don't feel perfectly right together. The final thing I think makes the puzzle a perfect analogy? 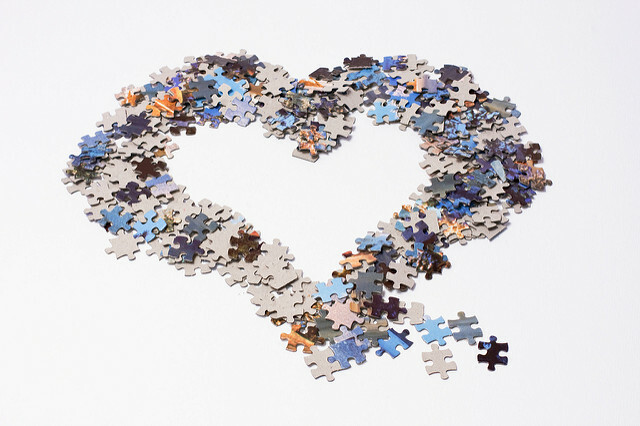 Unless you're a puzzle mastermind, it takes time to find the pieces that fit together. Especially when life offers you a 15,000 piece box. Whether you're writing a story with romantic elements or looking for a special someone, I wish you the best of luck in finding a piece that matches.